We recently published an article, “How to Reduce Travel and Expense Costs for Your Company,” which offered seven time-tested strategies to reduce travel costs. One of the most important strategies we recommended was to negotiate rates. Negotiating supplier contracts like car, hotel, and even airline can be a huge savings opportunity. That said, we are also aware that in the travel industry, no two years are alike. Airfare rates rise and fall, hotel rates and demands shift, and the economy is in a constant state of fluctuation. Travel Managers and TMCs alike must be prepared for supplier contract negotiations by understanding industry benchmarks and adjusting their strategy accordingly. After all, the last thing anyone wants is to be on the losing side of the negotiating table. But with Autumn now in full swing, we’re sure the last thing you want to do is pour over data to determine trends in room rates, demand, occupancy, and supply before determining exactly how these data points can be applied. 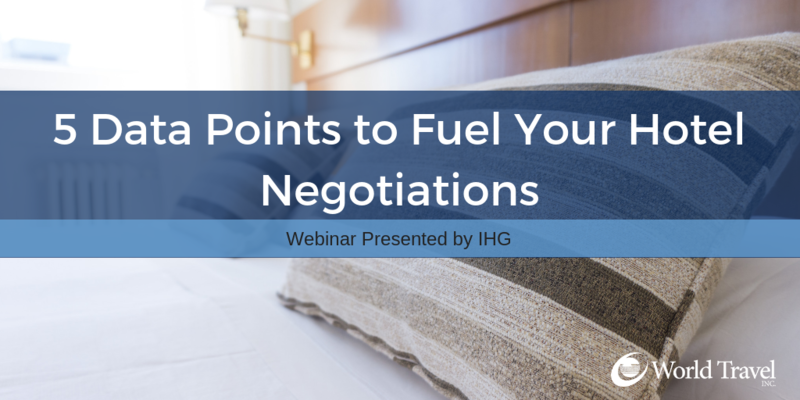 To take out the guesswork, we hosted a webinar with Ryan Plemmons, International Hotel Group’s Head of U.S. Transient Sales. In his role, he oversees sales teams in the US that deliver revenue from Corporate, Government, TMC, and Long Term Stay partner segments. Our very own Kelly Wagner, Head of World Travel, Inc.’s Consulting Services was also on the call. Kelly has been in the industry for over 20 years, and her team at World Travel handles air, car, hotel, and ground transportation negotiations for our clients. During the webinar, both sides explore the biggest trends and produce a forecast for both the hotel and travel industries. What are the biggest trends and data points you should look out for? The global economic climate is very strong from a GDP standpoint, and that steady growth is certainly fueling the lodging and travel industry overall. One thing to note is that although China is down from last year, they’re in a managed economic slowdown. Consumer spending is also up, and this is due to strong labor markets. Unemployment is at an all-time low, leading to more disposable income. The travel industry is gaining a higher share of the consumer spend, as it seems that the public is placing more value on experiences rather than tangible goods. Although corporate profits are cooling a bit, they are still at record highs, remaining conducive for both labor and travel growth. 2017 was an exceptional year, but 2018 is still forecasting to be significant for corporate profits. Revenue Per Available Room (RevPAR) is the biggest indicator of how hotel companies are doing, and compared to 2016, this year RevPAR is performing very well. RevPAR is influenced by both occupancy levels and average daily rates (ADR), and so these are both data points that companies should pay attention to as well, especially during RFP season. RevPAR is expected to slow in 2018 and 2019 due to lower room demand gains, but demand is expected to remain robust. RevPAR is also becoming increasingly ADR driven. Room demand surged in 2017 and remains strong even though growth rates have slowed. Group demand has slowed but it too is at a record high. Transient demand is up and has increased by more than 10% since 2014. Room supply growth has slowed, but many brands are building new locations and adding new properties. Much of the current supply growth is in mid-scale space. There has also been a strong demand for extended stay. Global occupancy is also at a record high, but keep in mind that occupancy can vary depending on the country or region, as well as events that are occurring there. For example, Japan will host the Rugby World Cup and the Olympics in the coming years, which will impact occupancy, demand, and rates. There is a lot of strength in the U.S. hotel market. Many cities are seeing occupancy rates of over 80%. After stagnant growth, hotel rates are on the rise on a global level. 2018 rates are 3.1% higher with France, Brazil and Canada leading the pack. If you have questions about reducing your travel spend, we’re here to help! World Travel, Inc.’s Consulting Services department works with clients to optimize supplier agreements, overseeing your annual negotiations and RFPs to bring more value to your travel program. Regardless of whether you do business with us, our team is happy to talk through your current concerns regarding your supplier contracts and how they may be improved. Please contact your World Travel, Inc. Account Manager or reach out to our sales team at Sales@worldtravelinc.com.